Welcome to the sixth installment of PuzzleNation Book Reviews! 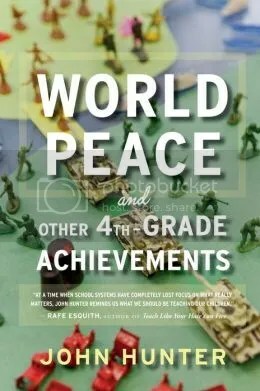 Our book review post this time around features John Hunter’s World Peace and Other 4th-Grade Achievements. What did you do in fourth grade, fellow puzzlers? Did you master long division, or delve into the history of the Civil War, or expand your vocabulary skills? The kids in John Hunter’s fourth-grade class negotiated lucrative trade agreements, solved global warming, and saved the world. Yeah, I know. I feel like a slacker now too. I frequently post articles that reinforce my heartfelt belief that puzzles and the skills we develop solving puzzles make the world a better, more interesting place. And the World Peace Game, John Hunter’s marvelous brainchild, takes empty-space learning to a whole new level. Instead of regimented, test-based education, empty-space learning encourages students to learn and fail by doing, developing social skills, a deeper sense of the world’s complexity, and an appreciation for hard questions. The World Peace Game is a fantastic example of what empty-space learning can do. A weeks-long interactive experiment wherein students try to solve real-world problems in a complex, multitiered simulation, kids will tackle poverty, war, environmental cataclysm, terrorism, ethical dilemmas, and more as they manage their imaginary nations. World Peace and Other 4th-Grade Achievements chronicles the lessons Hunter has learned from developing and running the World Peace Game for groups of all ages, offering dozens of examples of problems encountered — and circumvented — by young minds, each with a core lesson and something to celebrate. This is pure puzzle-solving at work on a massive, cooperative scale, and just reading this book gave me hope for the future. World Peace and Other 4th-Grade Achievements is a warm, funny, utterly optimistic testament to what creativity and innovative problem solving can accomplish. This entry was posted in Games, PuzzleNation, Puzzles and tagged Book review, DIY puzzling, games, Geeking Out, John Hunter, Pop culture, PuzzleNation, World Peace and Other 4th-Grade Achievements, World Peace Game by gmdirect. Bookmark the permalink.